Mount Prospect, IL – May 9, 2014 - GAM, a leading manufacturer of precision gear reducers and servo couplings used in automation technology, was recognized by the Northwest Educational Council for Student Success after partnering with Thomas Middle School to help educate students who are interested in STEM (Science, Technology, Engineering, and Math) fields. The Northwest Educational Council for Student Success (NECSS) is a secondary and post-secondary regional educational collaborative that focuses on student success and opportunities, teacher qualifications and professional development, and enriching collaboration between all district partners and the local communities. NECSS partners include school district 211, 214, 220, EFE 070 and Harper College. 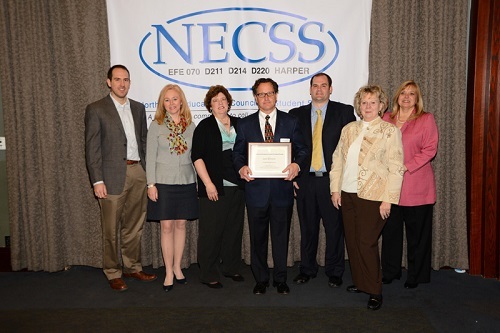 Gary Michalek, CEO of GAM, accepted the award at the NECSS Business Partner Recognition Breakfast for the partnership with Thomas Middle School. "If we want to maintain our leadership role in the U.S. for manufacturing, we need to inspire and expose our young people as early as possible to the wonderful opportunities that exist in today’s manufacturing environment and the future it holds," said Gary Michalek. Twice a year, students from Thomas Middle School visit GAM as a part of their Careers Connection class. The Careers Connection class is a three part program designed to help prepare students for the work force by introducing career options as well as identifying their interests and strengths. Students take surveys, participate in discussion groups, and then have an on-site job shadow experience. When students visit GAM for their job shadow, they are engaged in an interactive learning experience as they are tasked to help design and manufacture an actual product. GAM engineers walk them through the typical product design process and present them with challenges that they have to solve. From concept generation through geometric dimensioning and tolerancing, the students get first hand exposure to real world engineering concepts. Using the latest CAD modeling software as well as 3D printing technology, they get to see their design prototype before it is manufactured. At the end of the day, students leave GAM with a part that they actually produced. In the most recent visit, students left with a docking station for a smartphone that was machined from aircraft grade aluminum. "We enjoy participating in this program with Thomas Middle School because we get to help students learn and get excited about engineering and manufacturing," said Craig Van den Avont, President of GAM. "It's extremely rewarding to know that GAM played a positive role in the lives of the next generation of engineers."